Rocol manufacture a range of market leading industrial lubricants for use in aerospace and manufacturing industries. Founded in 1882, Rocol pioneered the use of non-corrosive industrial lubricants which were far superior to competitor products. Rocol has continued to pioneer in this area to create highly technical products which combine enhanced performance with superior quality and reliability. Food grade lubricants are specially formulated for use on food production line machinery. They are manufactured from FDA approved ingredients and provide enhanced performance at a range of temperatures from -20°C to +150°C. Food grade lubricants are available in two categories, Purol which is suitable for direct contact with food and Foodlube which is approved for food and beverage use but cannot come into direct contact with food. Rocol industrial lubricants are split into three categories, Sapphire for general industrial applications, Aerospec for aerospace applications and Biogen for industries that require an environmentally friendly lubricant without any performance loss. This includes marine and renewable energy industries. 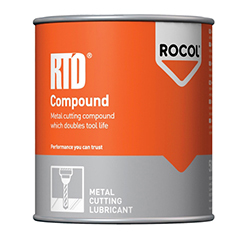 Rocol metal working lubricants are available in three categories, Ultracut which offers a standard range of cutting fluids, Tri-logic which is an extreme cutting fluid for specialist metals and RTD which helps prolong the life of cutting tools. For gas and plumbing industries, Rocol manufacture a range of non-corrosive gas leak detector sprays and seals. Suitable for use on LPG and natural gas pipelines, Rocol gas seal is resistant to vibration and compatible with most foam forming leak testers. The Rocol site safety line comprises of a range of anti-slip solutions, traffic management, line marking and cleaning wipes. These highly durable solutions can be used in industrial environments to help protect staff and contractors from injury.